"Perfect to pair with pasta and salad or even use as a dipping sauce." "A delicious mixture of white truffles and light cream." "Red and black peppers give this sauce its tasty, tangy kick." "It spreads easily and tastes fantastic on pizza." "It’s the perfect base for adding other ingredients." "Made from 100 percent Italian ingredients." If you're interested in making pasta yourself, check out our list of the best pasta makers available. 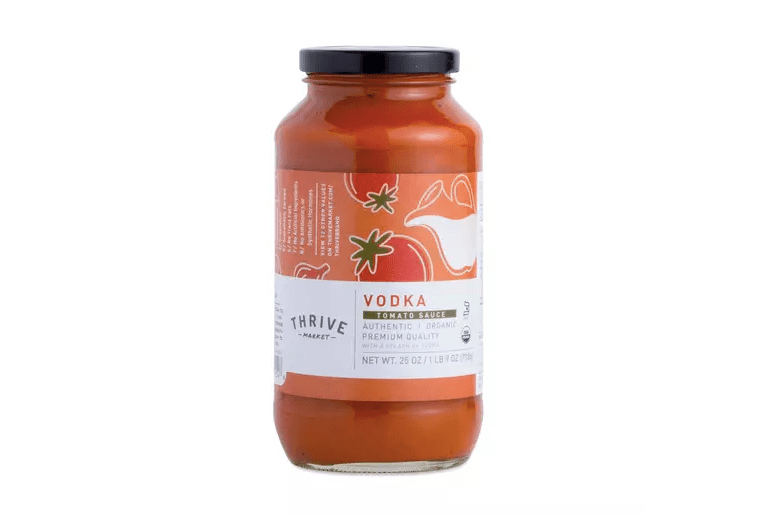 Finding a fresh and delicious vodka sauce that comes from a jar can be tricky, but the Thrive Market Organic Vodka Pasta Sauce tastes like it’s been slow-cooked on the stove for days. This all-natural vodka sauce is chock-full of fresh ingredients like Italian tomatoes, organic olive oil, and fresh cream, in addition to fresh garlic, onion, and basil. And the subtle vodka flavor gives the sauce a certain depth that sets it apart from regular tomato sauces. While some customers wish the vodka flavor was more apparent, it's still a delicious and well-balanced option for nights when you don't have time to make it from scratch. Incorporate it into a meaty one-pot pasta dish or use it for penne alla vodka. Bursting with flavor, Williams Sonoma's Truffle Alfredo Pasta Sauce is worth its slightly higher price tag. A delicious mix of white truffles and light cream is rounded out with aged Parmigiano-Reggiano cheese, unsalted butter, egg yolk, salt, and black pepper, and more. Because this sauce is rich and hearty, it works with any type of pasta, but a few online reviewers said that it was particularly scrumptious when paired with cheese ravioli. Overall, if you're looking for an extra-special sauce to serve on pasta night, this option is definitely the way to go. If you love spice, The Jar Goods Classic Spicy Tomato Sauce is the sauce for you. Vine-ripened tomatoes, fresh onions, olive oil, garlic, and basil hold down the ingredient list, but it’s the red and black pepper that really gives this sauce its tasty, tangy kick. Plus, it doesn't contain added sugars, artificial flavors, colors, or preservatives, so you can rest assured that you’re getting an all-natural product. While some online reviewers pointed out that while this sauce is definitely on the hotter side, it’s not off-putting, either. No need to spend several hours making your own pizza sauce when you can just use Trader Joe’s “Trader Giotto’s” Tomato Basil Marinara Sauce, a winning blend of tomato puree, tomatoes, garlic, parsley, oregano, and basil. Online reviewers also liked that it was affordable and that, thanks to its consistency and ingredients, it spreads easily and tastes fantastic on pizza—though it works equally well when added to soups, stuffed pasta, lasagna, or any other marinara-based recipes. Want to try your hand at homemade pizza? Take a peek at some of the best pizza stones you can buy. When you’re looking for a great basic spaghetti sauce, this option from Classico does the trick. This sauce is made from ripe tomatoes, aromatic basil, garlic, onions, and a hint of a few other spices. Since it’s simple yet flavorful, it’s the perfect base for adding other ingredients—like grilled onions, extra garlic, or fresh herbs—into the mix. It’s also gluten-free and contains no synthetic flavors, colors, or preservatives. Plus, at just 70 calories per serving size, it’s on the lighter end of the spaghetti sauce spectrum. If you don't have time to make a batch of homemade tomato sauce from scratch, don't settle for something that's watery and tasteless. If you want your jarred sauce to taste like it came from the stovetop, this version from La San Marzano is your best bet. This brand, which was founded more than 40 years ago, makes their marinara sauce from 100 percent Italian ingredients, including whole peeled tomatoes, olive oil, sea salt, sliced garlic, oregano, basil, and black pepper. According to one enthusiastic online reviewer, this sauce "tasted like my Italian stepmother used to make—and she would cook it for hours." Do note, however, that its texture is on the thinner side. Just because you have dietary preferences or needs doesn’t mean you have to skimp on flavor. If you’re looking for a sauce that's vegan, try Thrive Market’s Organic Roasted Garlic Pasta Sauce, which tastes just as delicious (if not more so) than traditional tomato sauce. Featuring 100 percent certified organic ingredients like onions, olive oil, San Marzano tomatoes, and roasted garlic, this sauce is both tasty and healthy. Throw this sauce on spaghetti for an easy weeknight dinner, drizzle it over vegan lasagna, or use it as a dipping sauce for toasted garlic bread. Reviewers like that this sauce contains simple, clean ingredients with no added sugar, and that it “tastes homemade.” A few reviewers also noted that they loved the freshness of the tomatoes and the chunks of garlic.